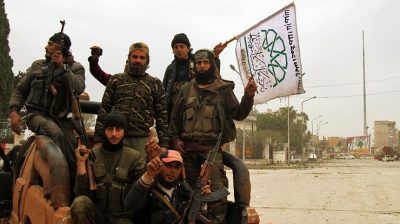 TMR Editor’s Note: Never in American history has the whole world come to understand that the USA is actively supporting various terrorists groups as they make their last stand in Idlib Province, Syria. Talk about the theater of the absurd! In their sheer desperation to control Syria, the Neocon Zionist cabal has hijacked the U.S. military and is using American blood and treasure to support hardened terrorist groups to cut their losses in Syrian War. Really, how crazy is that? Compared to the fact that the American people seem to be clueless about this massive and odious betrayal, it’s not very crazy at all. Yes, there is very little being said about this repugnant misuse of the U.S. Armed Forces. But ignorance of the reality of a nation at war (an unprovoked war of naked aggression) is no excuse, especially when that war is being conducted in our name and with our tax dollars. Do you know who, or whose assets, they are protecting. N.B. The article below lays out the grim realities of this Neocon-produced horror show.